Bella will meet her shaven-headed hero at the John Smith's Stadium. Huddersfield's Aaron Mooy is to meet a young American girl who gained inspiration from the midfielder's shaven head during her cancer treatment. Bella, seven, from Dallas, lost her hair during treatment for brain cancer and took solace when noticing the bald-headed Mooy playing for Australia during last summer's World Cup. The excitement of seeing Mooy prompted Bella's parents to buy a full Huddersfield kit with 'Mooy 10' printed on the back. Huddersfield and Mooy became aware of Bella's condition following a post on Instagram. Bella and her father will now travel to the UK to meet Mooy as the Terriers' VIP guests for their home Premier League game against Leicester on April 6. The cost of the trip has been covered by Huddersfield-based company Paxman, who pioneered scalp cooling technology to prevent chemotherapy-induced hair loss and has US offices in Texas. 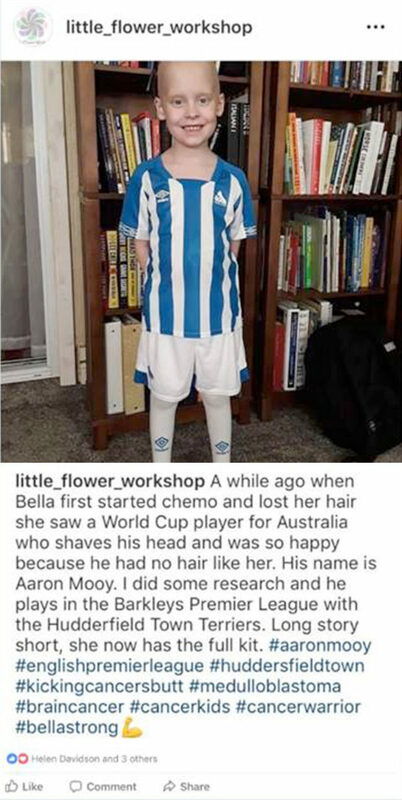 Bella's mum, Lauren, said: "During her radiation treatment, Bella watched the World Cup with Daddy and saw Aaron Mooy playing. "She had recently lost her hair due to treatment and was excited to see a player who looked like her. "We decided to order her a Mooy uniform a few months ago, thinking she might wear it at Halloween, or even just for fun, something she could wear and hopefully not worry about the fact that she had lost her hair – she loved it." Bella lost her hair during treatment for Medulloblastoma, a form of brain cancer in children. "Her treatment has been going well so far and we hope we are at the end of it now," Lauren added. "We're just waiting for her immune system to recover." Huddersfield commercial director Sean Jarvis said: "Everyone at the club is looking forward to welcoming Bella over for her special trip in early April.